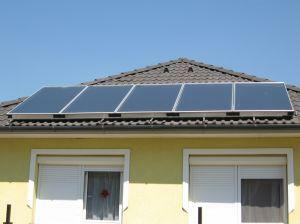 Solar Panels are ideal for green homes. Green home builders will specialize in building homes that are environmentally friendly without compromising on convenience or style. If your idea of a green home is a tepee in a field or a mud hut on a hilltop, think again! Modern green homes are just like any other home, however have been built with many energy saving and alternative fuel sources as an integral part of the building. A modern green home will also be built using materials that are renewable, have been recycled or have been created with a limited negative impact on the environment. One of the key benefits of a green home is that it is kind to the environment. This means that during the building process, wood will come from sustainable sources and materials will have been sourced locally where appropriate. Numerous other benefits of green home design are of great interest to homeowners. For example, green homes are built with energy efficiency in mind and are therefore less costly to run than traditional homes on a day to day basis. Green homes also use alternative fuel sources where appropriate, such as electricity from solar panels or even wind generated electricity from a turbine. Well insulated homes keep warm in the cooler weather and cool in the warmer weather, requiring less energy to heat or cool. Many building and construction firms are keen to demonstrate their green credentials by employing many positive environmentally friendly practices. Specialist green building firms, however, are the ones most likely to be up to date with the latest developments and initiatives. They will be passionate about green living, not purely going through the motions for the sake of looking good. A specialist green home builder will be able to advise on a solution that is tailor made for both the individual householder and the specific environment. The process of building a green home starts early on. It is important that the land on which the home is to be built is suitable for the purpose and that the building is not going to damage the environment. This means that trees should be preserved and living areas, such as planted gardens or green roofs, are planned. The impact of the building on the environment needs to be considered; will building on the land cause problems with wastewater or alter the habitat of wildlife? The specialist green builder will advise and guide homeowners through the entire process, ensuring that the needs of the environment are balanced with the needs of the client. Green home builders vary from small firms that work in a single area to large organizations or co-operatives who work over a larger region. Finding the right green builder will entail talking to many individuals and firms and determining the one that meets the householders' requirements. The process of building a new house is very much a collaborative process or a partnership and as such it is paramount that both parties can work together with mutual trust and respect. Green organizations and directories will often have lists of green builders, and a great way to find reputable builders is to ask around and listen to experiences. Word of mouth is the best form of recommendation and people are often very willing to give feedback about their experience with a particular builder. There are many green building resources on the Internet. These range from builders co-operatives to websites offering information about different aspects of green homes. Building a green home can provide you with years of comfort and pleasure while having a minimum impact on the environment.